In the Toasted Glass household, cocktails aren't just for special occasions - they are more, a way of life - but I am aware, that for many, cocktails are saved for celebrations or nights on the town. However, I am of the opinion that half the fun of having a drink, is in the making of it. A little pomp and ceremony lends an air of gravitas to the situation and elevates it from merely drinking, to a more exciting and creative process, rendering me, an artist, as oppose to just a piss artist. Anyway, the only problem with this attitude, is that when there really is something to celebrate, how do you go the extra mile? What can you possibly drink that is more fantabulous than your everyday cocktail consumption? This was the spiritous conundrum that Mr TG and I were faced with this week as we had much to be thankful for, not least of all, the timely return of the younger TGs to school. Most of all, however, we wanted to toast the launch of Toasted Glass online. Of course, Toasted Glass has been selling online through Etsy and Folksy for close to a year now, but there's nothing quite like having your very own website. Much like buying your first home, it is fraught with difficulties, but the joy of putting all your own things in there, exactly where you want them to go, is something quite special. The whole process has been, very much, a joint effort and not something I could have done without the wonderful Mr TG. I am very proud of our labours and hope you will visit us in our new home at toastedglass.co.uk. There is also a link on the homepage, direct to this blog, so you can shop for glassware and then see it action, here. So, you can see my quandary - lots to celebrate and the need for some extra special cocktails to help us along. My instincts led me inexorably, to champagne. 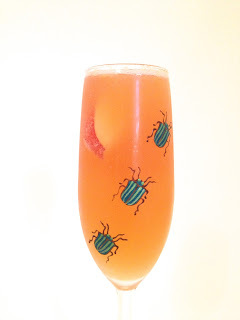 I am very partial to a glass of bubbly and even more so, to a champagne cocktail, as previous posts will support (see list at the end of this post), so to ring the changes, I went for some pink bubbles. There are many bubbly rosés to choose from - big champagne houses like Veuve Cliquot and Moet produce pink fizz as well as far more pocket friendly cavas rosados from Freixenet and all the big supermarkets. It really is just a matter of preference and budget as to which you choose, but just make sure it is a brut fizz as the cocktails all have some form of sweetness to them that would soon become sickly if mixed with a sweeter wine. First of all, I rustled up a variation on a Kir Royale, the classic champagne cocktail of Creme de Cassis and champagne. I threw into the mix, an ounce of Chase Bramley Apple Vodka, which has a slight sweetness of it's own, but a very natural apple flavour, from the apples grown in their orchards at Rosamaund Farm in Hereford. Having made a pilgrimage to the farm and distillery this summer (you can read about it by clicking here), I can assure you that the apple flavour is 100% natural. Chase often make products in small batch numbers, so if it is not available, you could try either Smirnoff or Absolut, who are both making naturally flavoured apple vodkas. I haven't tried either, as yet, but the Absolut Orient Apple contains a hint of ginger too, which sounds quite interesting, although perhaps not for this particular drink. Add the vodka and cassis to a shaker, with a little ice and shake briefly, just to cool the spirits down. Next up, was a cheeky little gin number. There is not much in life that can't be improved with a drop of gin, says I, and this is no exception. The combination of Williams Chase GB Extra Dry Gin which has a lot of juniper and spice, with floral, citrus zest of passion fruit, makes for a flavourful and fresh cocktail with plenty going on to entertain your taste buds. Scoop the pulp from the halved passion fruit and add to the shaker with the syrup, gin and ice. Shake hard and strain into a chilled champagne flute. Top with pink fizz and garnish with a slice of white peach. This final cocktail was my favourite of all. The combination of bitter, sweet and fresh orange with a dash of fizz to pep it all up, is just delicious. I keep coming back to variations on this theme, with or without fizz and have not found it lacking. Before you cut the orange to squeeze it, take a sharp knife and cut a strip of zest to use as garnish. Add all of the spirits and the freshly squeezed orange juice to a shaker with ice. 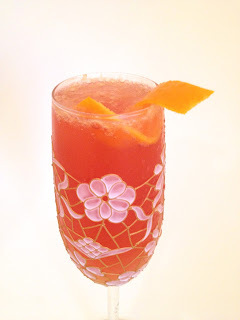 Top up carefully with pink fizz - the combination of fresh orange and fizz can be quite volatile. Twist the strip of zest into a spiral, over the top of the drink, releasing the lovely aroma and garnish. 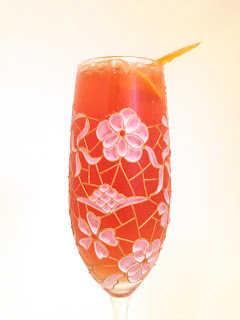 For more fabulous champagne cocktails, take a wander through some vintage posts on this blog.